Or most of it, anyway. Truth to tell I've been feeling pretty rotten this week, even more than when I wrote this post. I'm constantly fatigued and my brain feels like it's made of mushy peas. This has come at the same time as our scheduled strategic planning process at work, when myself and my colleague Rajat are holed up in my flat plotting over my dining room table. Strategic planning is important but, my word, it can be tedious at times. So this is not the best time for simple mental processes to feel like they are more taxing than studying for my finals. I'm still blaming the weather. Apparently the US is currently experiencing a "punishing heatwave" that has killed 22 people right now. The conditions sound very similar to Delhi (mid to high 30s and very high humidity, which the human body is not well equipped to deal with). So I guess it's not all that surprising that I'm not feeling in the peak of condition right now. However, I still have a job to do (not to mention a blog to maintain) so I am just going to have to find the energy from somewhere, ideally without resorting to stimulant drugs. Anyway, while we're on the subject of health, here's something else I'm having to get used to: the possibility of contracting a tropical nasty. Delhi is not too bad health-wise but one thing I do have to watch out for is mosquitoes. It's not that the city is teeming with them, but the ones that are around have a significant chance of carrying some deeply unpleasant bugs in their evil little saliva glands. I really, really don't want to get any of these diseases. 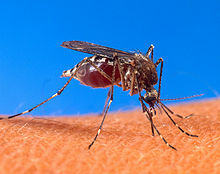 The chances are I won't - at least in the case of Chikungunya, which records a few dozen victims in the city each year. Not bad for a city of 17 million. Malaria cases number a few hundred each year. Dengue, on the other hand, is much more prevalent, with around 6,000 victims last year. Still not too bad odds, but enough to make you more than usually worried about the mozzies. This has also been drummed into me by my landlord, who is positively convinced that I am certain to succumb to one of these horrible diseases. He's not totally without cause. There is an open drain running through the middle of Defence Colony, which is currently in the process of being covered (when finished it is due to become a large and hopefully lovely park). For the moment, though, it's not just a breeding ground for mosquitoes, it's a breeding ground that is constantly being disrupted and disturbed by dozens of working men. So there are plenty of mozzies around. The little buggers have also got every angle covered. While malaria mosquitoes attack during the night, dengue and chikungunya-carrying ones favour daytime snacking. So you can never relax. Long trousers, liberal use of insect repellent, and regular spraying of one's flat are the order of the day. Despite these precautions, I've picked up three or four bites since I moved here. The most evil life form known to man? Most of the cases of these diseases, of course, tend to be found in slums of the city where conditions are poor and people can't afford the kind of precautions I am able to take. So with a bit of care I should make it through my time here without enduring weeks of horrendous pain (horn honking-induced headaches excepted). Meanwhile, I just have to learn to live with this kind of threat. My Indian colleagues find it amusing that I'm unable to endure a mosquito in the office - it has to be squished as soon as I'm aware of its presence. Which goes to show, of course, that statistically they are really not that much of a threat, and most people from Delhi barely give them a second's thought. On the other hand, you never know. So I'll keep smearing on that repellent for the foreseeable future. Take care of yourself in the heat. We have our second heatwave coming this week with extreme heat exhaustion warnings. Temps are supposed to be over 40 degrees, heat index being more than that of course. It's so easy to get sick!